Musings of a Furniture Maker: Three of a Kind? Several weeks ago I received an urgent email from a freelance writer who claimed to be on a deadline to submit a design article to Toronto's Globe and Mail newspaper. She was keenly interested in my Bow Tie pedestal table, so I quickly sent her specifications, pricing and high resolution images. It was only after the article was published that I realized what it really was. Called "Three of a Kind", the article was one of an ongoing series of abbreviated sound bytes which take 3 similar looking pieces of furniture to compare them - primarily on the basis of price. One previous article compared a $2560.00 Le Corbusier club chair to a $499.00 POS from Ikea. What was the main point of comparison between the two? Both were chairs covered in blue fabric. A solid birch 3 legged table by Tom Dixon was ambushed in a similar fashion when compared to repackaged landfill offerings from Ikea and West Elm. What I find unfair about this kind of homogenized design pseudo-journalism is that it doesn't properly compare apples to apples. For example, my Bow Tie table is a hand made one-of-a-kind piece that is crafted from FSC and NAUF certified woods, non-UF glue and low VOC finish. The top has a hand cut diamond matched inlay pattern, with additional inlays in the collar and plinth made of traditional holistic woods such as Black Walnut and Narra. It's no surprise that this table ended up being the priciest of the three shown. The cheapest of the tables was a variation of a block stool that is imported by the containerload from some place in Africa. The table at the intermediate price point is a similar looking piece of mass production that is also imported by the containerload, only in this case from a factory run by Gus* Modern in China. In the grand scheme of things this "Three of a Kind" concept of literary penmanship isn't all that difficult to emulate, as I'll demonstrate here with the following 3 examples of cars. Please study these images carefully. 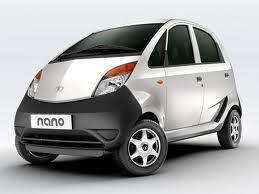 One is of a finely engineered $2900.00 precision instrument manufactured by Tata Motors of India. 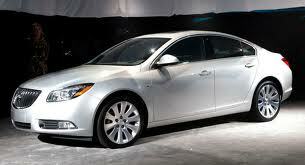 At the middle price point we have a Buick Regal by General Motors, which has a base price of $27,000.00. (It's unclear from the photo whether this particular Regal has been manufactured in North America, or at one of the new GM factories recently built in China). 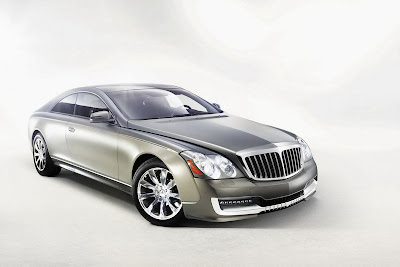 Finally we have a Maybach 57S Coupe that has been customized by Xenatec of Germany to the tune of $1,000,000.00. Can you tell them apart, even though all 3 of these cars share seemingly identical silvery paint finishes?